One reason why people love Live Casinos is because they have this sense of authenticity that not most games have today. The art of ‘live’ is slowly being forgotten with most people even preferring to record something through their smartphone instead of immersing themselves in the moment. 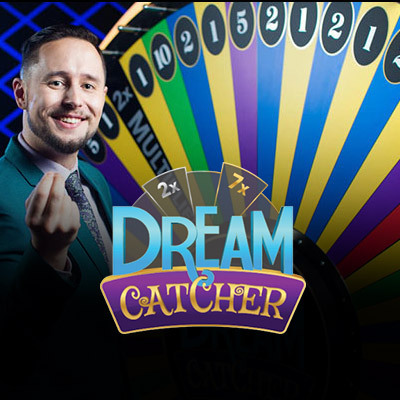 That’s the gap that Evolution Gaming noticed in the market of online slots which is what led to the creation of Dream Catcher, a live online casino slot. It follows the Wheel of Fortune format. It’s a simple version of roulette wheel, but with an added twist – it’s presented by a host who will charm you and the audience with every spin of the wheel.The game is played live on a big wheel featuring 54 sections, two of which are 2x and 7x multiplier values. Not many companies out there can claim the title of being the best when it comes to providing live dealer services to online casinos, but Evolution Gaming can. The company has supplied live games to some of the biggest names in the industry since 2006. They have a large spread in Europe, having partnered with several operators like Ladbrokes, Paddy Power, William Hill, 888, etc. Evolution Gaming can attribute their success to the quality and quantity of products they provide. They have several live dealer casino classics with many of the games offered in multiple variations. The game is streamed in HD. The background includes a glitzy live TV style look that comes complete with an audience. The game also features different camera angles to give you a full view of the wheel spins. Dream Catcher has a nice gentle soundtrack with bursting sound effects every time you win. The game follows the Wheel of Fortune format without any special bonus features to highlight. The aim of the game is to set a wager on a number you think the wheel is going to stop at. Each of the numbers on the wheel offers a different payout value which is the same as the value of the number it stops at.For example, if you set your wager on the number 20 and it lands there on the wheel then you will receive a 20x payout. If the wheel lands on the multiplier values of 2x or 7x, all bets remain and the player gets a chance to spin the wheel again until it stops on a number.If it stops on 20, you get a 20x payout which is then multiplied by the multiplier value. The best outcome of the game would be to land on the multipliers consecutively and then the number you initially placed your bet on. This can lead to a massive win. One can also place bets on more than one number before spinning the wheel. You have two options to choose from if playing on a computer;Classic or Fullscreen HD. Classic mode would be better suited for players using a slower connection. The game is also available on mobile devices. Jackpot- The maximum payout can go up to 500,000 coins. Dream Catcher has got it right when it comes to presentation. The game is entertaining and involves that sense of entertainment with every spin. It’s a nice live game if you are looking for something a little different than the usual online slot setup.